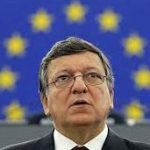 On September 13, 2013 at 10:17 PM ET, C-Span broadcast the State of the European Union address given by Jose Manuel Barroso. The speech was actually delivered on September 11. It’s pretty safe to say that most Americans have never heard of Barroso because our mainstream media considers it more important to cover the latest traffic accident than to mention what other world leaders say – except when it serves a political purpose as in the case of Vladimir Putin recently. 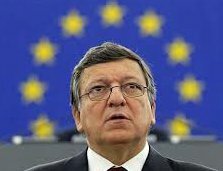 But if you were to investigate Jose Manuel Barroso – who he is, where he came from and what he does in the European Union, you would understand much better what is going on in our country. Barroso was born in 1956. He was Prime Minister of Portugal from April 6, 2002 to July 17, 2004. He is the 11th and current President of the European Commission since November 23, 2004. He graduated with a degree in law from the University of Lisbon. He did research for a Ph.D at Georgetown University and Georgetown’s Edmund A. Walsh School of Foreign Service in Washington, D.C. but his CV does not list any doctoral degree (except honorary). He is a 1998 graduate of the Georgetown Leadership Seminar. Barroso’s political activity began in his college days, before the Carnation Revolution of 25 April 1974. He was one of the leaders of the underground Maoist MRPP (Reorganising Movement of the Proletariat Party, later PCTP/MRPP, Communist Party of the Portuguese Workers/Revolutionary Movement of the Portuguese Proletariat). In an interview with the newspaper Expresso, he said that he had joined MRPP to fight the only other student body movement, also underground, which was controlled by the Communist Party. Since Barroso is five years younger than I am, and I know what I was doing and knowing in 1974, I have to believe that Barroso was born into a communist revolutionary family and was groomed for leadership – a rising star from the underclass – like Bill Clinton and Barack Obama. Now that you know who Jose Manuel Barroso is, you need to know what the European Commission is and what they do. What they do is write the international laws for the European Union. In the terms I’ve been using, they are the legal foot soldiers for the Empire of the Black Robe (links on the right). 4. representing the EU internationally, for example, by negotiating agreements between the EU and other countries. The Commission has the ‘right of initiative’ – it can propose new laws to protect the interests of the EU and its citizens. It does this only on issues that cannot be dealt with effectively at national, regional or local level (subsidiarity principle). When the Commission proposes a law, it tries to satisfy the widest possible range of interests. To get the technical details right, it consults experts through various committees and groups. It also holds public consultations. The Commission’s departments produce a draft of the proposed new law. If at least 14 of the 28 Commissioners agree with it, the draft is then sent to the Council and Parliament. After debating and amending the draft, they decide whether to adopt it as a law. With the Council and Parliament, the Commission sets broad long-term spending priorities for the EU in the EU ‘financial framework’. It also draws up an annual budget for approval by Parliament and the Council, and supervises how EU funds are spent – by agencies and national and regional authorities, for instance. The Commission’s management of the budget is scrutinised by the Court of Auditors. The Commission manages funding for EU policies (e.g. agriculture and rural development) and programmes such as ‘Erasmus’ (student exchanges). As ‘guardian of the Treaties’, the Commission checks that each member country is applying EU law properly. If it thinks a national government is failing to apply EU law, the Commission first sends an official letter asking it to correct the problem. As a last resort , the Commission refers the issue to the Court of Justice. 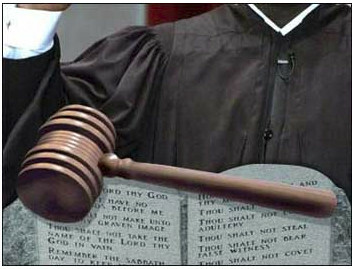 The Court can impose penalties, and its decisions are binding on EU countries and institutions. The Commission speaks on behalf of all EU countries in international bodies like the World Trade Organisation. It also negotiates international agreements for the EU such as the Cotonou Agreement (on aid and trade between the EU and developing countries in Africa, the Caribbean and the Pacific). On the history page of the European Commission, they date their history from the European Coal and Steel treaty but that was only the beginning of the formal organization that was formed to incrementally crush the national sovereignty of the nation-states of Europe to build the European “common market”. The true beginning was even before that but American history joins the conspiracy at the point of the Marshall Plan – the true purpose of which was concealed from the American people. With the benefit of hindsight, the global idea was to create continental market states – commercial zones under a world system of law – the Empire of the Black Robe. So how did I happen to catch all of this? An interesting thing happened. Often, I have C-Span on to listen to while I’m doing other things. Last night, I was playing cards online. I distinctly heard Jose Barroso say the words, “our world state” and even though my attention was elsewhere, those words came through loud and clear. I thought that’s an interesting thing to say so I searched on the term, ‘world state’. Wiki came up first on the list of course, but it was all I needed. The World State is the primary setting of Aldous Huxley’s 1932 dystopian novel Brave New World. In the novel, the World State is a unified government which administers the entire planet, with a few isolated exceptions. The motto of the World State is Community, Identity, Stability. 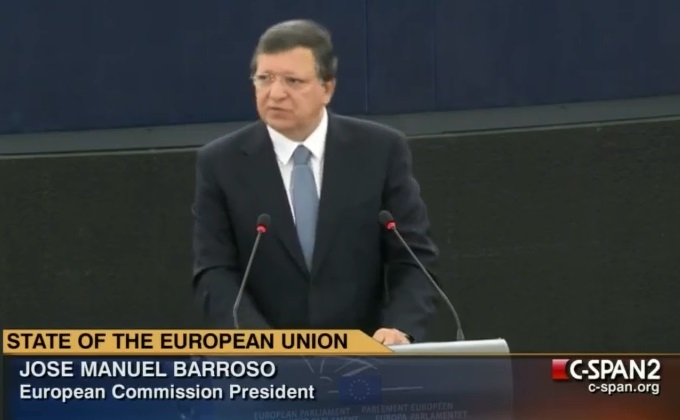 In his 2013 State of the Union address, President Barroso made a rallying call to ‘all those that care about Europe, whatever their political or ideological position, wherever they come from, to speak up for Europe’. So let us continue to work together to reform our economies, for growth and jobs, and to adapt our institutional architecture. Only if we do so, we will leave this phase of the crisis behind us as well. There is a lot we can still deliver together, in this Parliament’s and this Commission’s mandate. What we can and must do, first and foremost, let’s be concrete is delivering the banking union. It is the first and most urgent phase on the way to deepen our economic and monetary union, as mapped out in the Commission’s Blueprint presented last autumn. The legislative process on the Single Supervisory Mechanism is almost completed. The next step is the ECBs independent valuation of banks assets, before it takes up its supervisory role. I suppose we could consider it just a coincidence that the American Action Forum sponsored a panel discussion on C-Span featuring Barney Franks, Bill Thompson, Douglas Holtz-Eakin, Steve Liesman (gotta love the name for the CNBC anchor) talking about the 2008 Financial Crisis. Since I’d never heard of the American Action Forum, I did a search on them. They bill themselves as an “action-tank” – an independent non-profit but they must be connected with Harvard’s Institute of Politics. I think it’s pretty safe to say that in the coming year, there will be proposals for an international solution – billed as an American solution but however they present it, it will be the banking and monetary system for the Brave New World – the Empire of the Black Robes.